The 6600 Pedestal is the dependable workhorse line matrix printer that forms the foundation of the 6600 series. 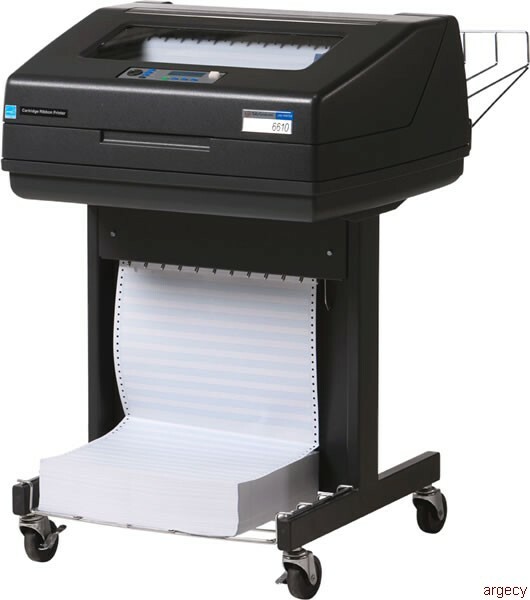 The 6600 Open Pedestal is the dependable workhorse line matrix printer that forms the foundation of the 6600 product family. It is compact enough to move around in just about any industrial environment. The 6600 Open Pedestal is presented in a small footprint with the convenience of either top tear or rear output. Accessory choices include a front input tray or two different rear trays. With a quick adjustment customers can reconfigure the printer to a top tear format. By adding the optional Acoustic Shroud, users can enjoy comfortable noise reduction while still having quick access to print jobs. Like all the printers in the 6600 family, the 6600Q is ENERGY STAR qualified and is ready to plug into your network and start printing from day one. Improved print quality Easier to read forms, especially in poorly lit environments. The higher impact force improves print clarity on multi-page forms. For applications that demand mobility, a front paper shelf allows the source paper to move with the printer. Also, raising the paper off the floor helps protect the media from damage. This shelf is strong enough and low enough to support a full box of paper. This output tray is ideal for large print runs. An adjustable back bar keeps the paper aligned and neat even when stacking large quantities. This assembly mutes the sound emanating from the paper exit slot to quiet the printer by a significant 4 dBA. This is an ideal solution for any pedestal printer operating near people trying to work. The shroud features a self-guiding paper path and easy tilt away design for ready access to the media.